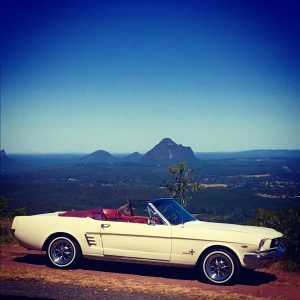 When it comes to Sunshine Coast Tours what better way to spend a day than travelling around in a classic 1966 Mustang convertible. Other vehicle options including a classic 1975 Rolls-Royce are available too. This iconic American beauty with its powerful and thumping V8 will pick you up at your Hotel/resort and take you on a tour that you’ll remember for a long time. So be sure to book your Sunshine Coast Tours with us for an unforgettable journey. So how did the mountain ranges get their name? Once you have marvelled at the Glasshouse Mountains and taken a few great snaps, the recently renovated Mary Cairncross Gardens on Mountain View Road provide the perfect location to sit back relax and enjoy the environment. Mary Cairncross Scenic Reserve comprises 55 hectares of subtropical rainforest overlooking the Glass House Mountains. A remnant of the rainforests that once covered the Blackall Range, the Reserve is now a living museum of diverse plant and animal life, which will delight with its tranquillity and beautiful settings. Picnic and BarBQ areas are dotted around the property. There is also plenty of parking. Weekends are busy however. Just a short hop from the reserve we can take you to Flame Hill Vineyard, tucked up behind the popular village of Montville, where you can enjoy sampling some of the areas finest wines. Each year Flame Hill has it’s annual grape “Stomp” where you can get your feet in amongst the grapes and “stomp”. The next is scheduled for February 24th 2018. Tickets for this event are $ 65.00 and sell out fast. Follow the link below to reserve your place now. Montville is a very popular tourist town and one you should not miss. Montville boasts glorious views of the Sunshine Coast & Hinterland while providing visitors with a unique shopping and dining experience. Many fine buildings run along and around Main Street and across the range. Lovers of nature will be at home among the parks & gardens, walking the rolling hills, national parks, rainforest’s and local waterfalls. Montville has some truly delightful and shops and eateries it is the perfect romantic getaway destination or simply a lovely place to relax and unwind and enjoy the surrounds. These are a few examples of the types of tours we can offer. At Champers we are more than happy to discuss a personal itinerary with you so you get the most out of this exciting area. For all your Sunshine Coast Tours use the inks on our site or call us now to make a booking. Be sure to check in with us for some great offers. Don’t forget we also provide Airport Transfer services, and provide some great transportation options for Weddings and School formals too. We look forward to hearing from you with any comments you may have.